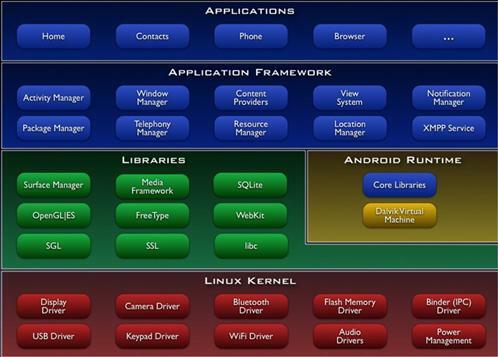 Android is a software platform and operating system for mobile devices based on the Linux operating system. It is developed by “The Open Handset Alliance”, a group of more than 30 technology and mobile companies. It is the first complete, open, and free mobile platform which is supported by Google. In fact Google is working with the Open Handset Alliance in this project. It allows developers to write managed code in a Java-like language that utilizes Google-developed Java libraries, but does not support programs developed in native code. In July 2005, Google acquired Android Inc., a small startup company based in Palo Alto, CA. Android’s co-founders who went to work at Google included Andy Rubin (co-founder of Danger), Rich Miner (co-founder of Wildfire Communications, Inc), Nick Sears (once VP at T-Mobile), and Chris White (one of the first engineers at WebTV). At the time, little was known about the functions of Android Inc. other than they made software for mobile phones. At Google, the team, led by Rubin, developed a Linux-based mobile device OS which they marketed to handset makers and carriers on the premise of providing a flexible, upgradeable system. It was reported that Google had already lined up a series of hardware component and software partners and signaled to carriers that it was open to various degrees of cooperation on their part. The unveiling of the Android platform on 5 November 2007 was announced with the founding of the Open Handset Alliance, a consortium of 34 hardware, software and telecom companies devoted to advancing open standards for mobile devices. Google has pledged to make most of the Android platform available under the Apache free-software and open-source license, once it is released in 2008. Details on Architecture: http://code.google.com/android/what-is-android.html .